The use of hardwoods in the home is due to the fact that they are durable and can be fitted to any type of taste or environment. They also bring a certain design element that can be anywhere from rustic to sleek. There are three types of woods that are commonly used to build furniture, frame homes, and to be used as flooring. They are Alpine Ash, Tasmanian Oak, and Messmate Australia Hardwood. Alpine Ash is generally used on the interior of a home – it is better used for making furniture and other items such as decorative items rather than used in framing. It is generally lighter in color. However, that color can be darkened quite a bit during the steaming process. This wood is considered to be good quality, particularly when making furniture with it. It is in the Victoria ash family, meaning that it is one of the tallest hardwoods in the world. This makes it a very popular choice – and rightly so considering its beauty and ability to be turned into sturdy yet eye-catching furniture. Tasmanian Oak is another popular hardwood choice. 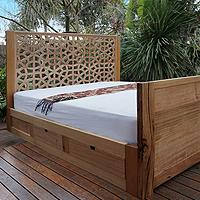 It is used interchangeably with two other eucalyptus hardwoods, with the main difference being where it grows. Due to its strength and inherent ability to be sanded and finished very smoothly, it is an ideal choice for framing, flooring, and furniture. It is also easily stained – meaning that it can be matched to other furniture pieces. This makes it a very versatile choice. Messamate Australian Hardwood is also a lighter colored wood and can have hints of peach in it. This wood can be used in framing and construction, however, it should be protected. Other options include flooring, indoor furniture (beds, cabinetry, etc.) and paneling. If you’re looking to replace flooring, add some furniture, or create some visual interest in your home in other ways, using hardwoods is a smart choice. The best thing to do is talk to someone who has the knowledge and ability to work with hardwoods. After all, this is a design choice that will be around for a very long time within your home (or outside), so you want to ensure that you are informed of all the pros and cons of each type of wood.